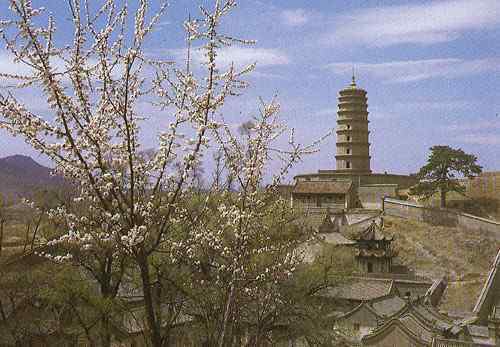 Mount Wutai is located in the northeastern part of Wutai County, Shanxi Province. Together with Mt. Emei in Sichuan Province, Mt. Putuo in Zhejiang Province, Mt. Jiuhua in Anhui Province, they are called the four most well-known Buddhist mountains in China. Wutai, its name indicates, consists of five platform-shaped peaks. Called the East, West, South, North and Central Platforms, they stand at altitudes of over 2,500 neters above sea level. The beautful monastic village called Taihuai lies deep in alpine valley, which is the center of Mt Wutai Buddhist religion - the site of Rituals to Manjusri Bodhisattva. Some of these temples are finely structured and built, with fine engravings and magnificent paintings. They reflect, from different angles, Chinese achievements of brick-stone buildings in the ancient time. There are now forty-seven operating monasteries with over a hundred monks and nuns, such as Xiantong Pagoda, Tayuan Pagoda , the Pusa Ding (Buddha Top), Prominence Monastery (Xiantongsi) , Buddha's Peak Monastery (Pusadingsi), Luohou Pagoda , Buddha's Halo Monastery (Foguansi), Nanchan Monastery . The Dabai Pagoda in the Tayuan , the representative among them, is 56.3 metres in height.